To talk about my first chess coach I need to start from the very beginning, or at least my chess beginnings. I think the year was 1982; I was going into 9th grade at the time and hoping to get a remote controlled tank for Christmas from my grandparents. It never happened. Instead I received a very interesting chess computer. They are ubiquitous now but back then not so much. At the time I was a big games person but not really into chess. Oh, I had played my dad chess a few times before and a friend once brought a little chess set on a school field trip and I recall playing chess then as well. “Playing” chess may be an exaggeration because I probably didn’t know how to correctly move the pieces. Anyway the Christmas gift was special for its time. I remember thinking the board which was partially wooden was fancy and the small wooden pieces cool. It also talked! 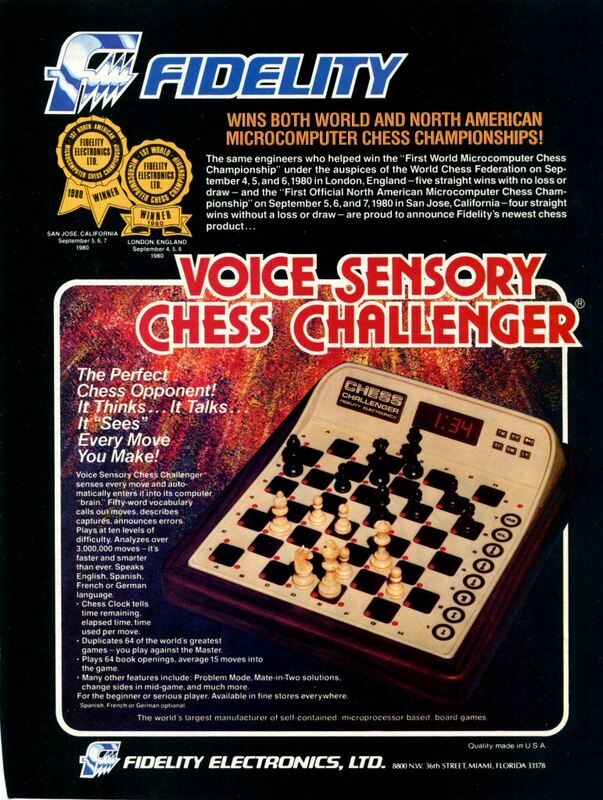 Fidelity Voice Sensory Chess Challenger was its name and when you pressed down on the squares with a piece the squares would light up and it would say the square letter and number and name of the piece moved. It also had an opening book and a database of 64 famous games. I remember it blurting out at me when I turned it on “I AM FIDELITY CHESS CHALLENGER YOUR COMPUTER OPPONENT, SELECT YOUR LEVEL!!! !” Ok game on, I wanted to beat this thing. It was a game to me like Space Invaders, Frogger or even Rolling Thunder (Rolling Thunder actually hit the arcades 4 years later in 1986). Fidelity Voice Sensory Chess Challenger! I got my first Chess book at this time “Bobby Fischer Teaches Chess” and I played and played and played this computer thing. My chess computer never refused a match and was always ready to play. The goal was simple, to beat it at the top levels. I recall the box on the game saying it had a chess rating around 1650. I really didn’t know what that meant but I thought the whole idea of a rating was extremely cool. I wanted a rating as well! So I played until I won and it took a long, long time, slowly moving up the skill levels. I learned at the same time. I learned about developing my pieces, controlling the center, tactics and many other ideas from the computer. However to beat the computer I didn’t copy his primarily tactical style. I eventually figured out that the computer loved to munch material. Sometimes it would munch material to the detriment of the safety of its King. For example, I may totally ignore his threat of a pawn or even an out of play piece and ultimately allow the computer to win that material if it allowed me to get a couple extra moves aiming at his King. In chess terms this would be called focusing on a time and space advantage. 1. Material (having captured more valuable material than your opponent). 2. Positional (Having your pieces and pawns placed on better squares than your opponent. A basic positional disadvantage could be having double or triple stacked pawns). And finally 3. Time and Space advantage (This typically involves having the initiative, where your opponent has to react to your moves). Of the three types of advantages I think a time and space advantage may be the toughest one for players to comprehend because it’s more abstract than the other two, particularly the time component. My approach to beat the computer was to use the abstract time and space advantage and to this day this approach has strongly influenced my style. Nowadays computers can beat any human player so a goal to beat a computer on the highest levels would be impossible. I think if I was just starting to learn chess today I wouldn’t be as interested in trying to play a computer. Today I also almost never actually play a game with a computer but I do use them in preparation and learning and think they are a fantastic tool to help improve your game for this purpose. In any case I owe a lot to Fidelity Sensory Chess Challenger my first chess coach, who had a big influence on my style of play.